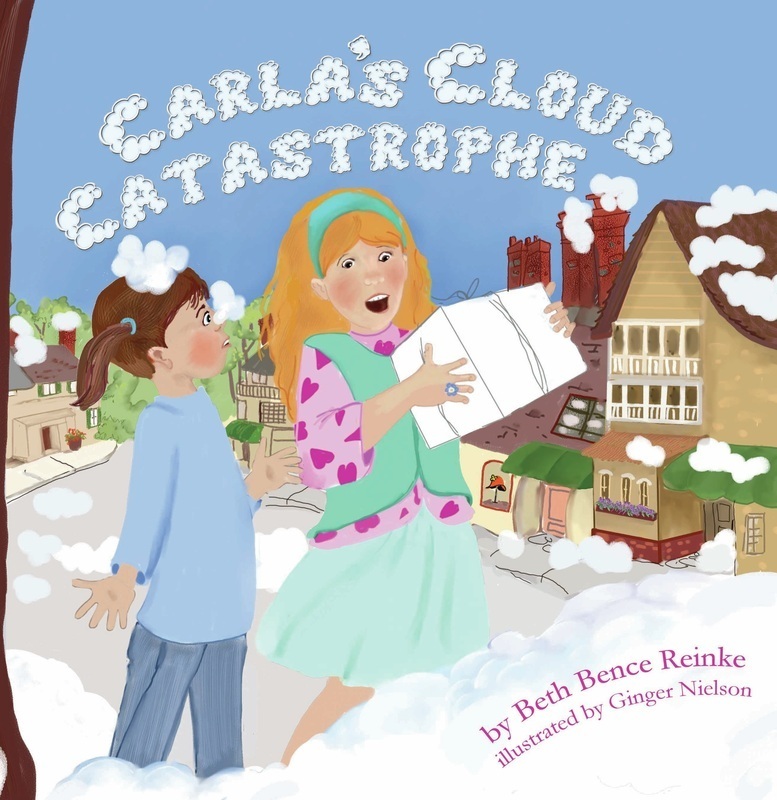 An imaginative, fun story is what you’ll find in Carla’s Cloud Catastrophe by Beth Bence Reinke. While walking home from the bakery with her father and her sister, Anna, Carla sees clouds falling from the sky. They cover everything: the ground, traffic lights, the grass, even Papa. Carla is afraid she’ll be late for her own birthday party. Papa is the Director of Transportation, so he is called into a meeting on how to handle the cloud situation. All the adults start tossing around ideas on what to do with the clouds. Could Carla have a better solution? Will she make it to her birthday party on time? Ginger Neilson’s beautiful artwork brings this story to life. From the puffy clouds falling on Papa to the fluffy mess at the public library, and from the splatters of clouds coming off the merry-go-round to the clouds stuck to the church’s steeple, every page is filled with wonderful illustrations to make this story come alive. Every youngster will want a copy of Carla’s Cloud Catastrophe! I received this book from the author in exchange for my honest review. I received no monetary compensation of any kind to provide my opinion. Clouds fascinate me. I take pictures of them. I watch them as they float across the sky, some of God’s beautiful work. Beth’s book sounds like so much fun. I’m betting Carla comes up with the solution. Marvelous review for a book I thoroughly enjoyed. You are so correct, Cheryl, about Ginger’s illustrations making Beth’s fun book come alive. Cheryl, I’m thrilled that you and your girls liked the book so much. :o) You have a knack for writing reviews and I appreciate you sharing my book with your readers. Thank you! Files for this book have been uploaded to printer. I should have the proof in 7 – 14 days, and then we order. What a great concept for a children’s story. Wonderful review! Great review, Cheryl. I love Beth’s books!